Finland is a cheerful nation in northern Europe who seems to be invincible to cold weather and temperatures. 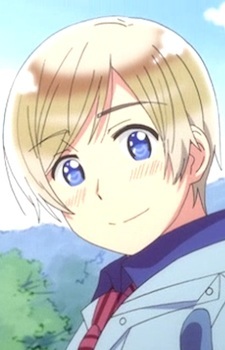 He has pale blonde hair and violet eyes, which were changed to brown in the anime adaptation and are shown as being blue in earlier pieces of artwork. Way back when, Finland ran away with Sweden from Denmark’s house. Finland was deathly afraid of Sweden at first, but eventually came to see that he’s actually kind at heart. The two own a dog together, which Finland named “Hanatamago.” Sweden, who was confirmed as being a homosexual by Hidekaz Himaruya, considers Finland as his “wife,” which Finland insists isn’t true. His personality is simple, and he is known as being gentle, honest, and warm-hearted. He works hard at everything, and can display super-human strength during times of crisis, making him better to have as a friend than as an enemy. Finland seems shy and soft-spoken, but is actually quite the talker. His hobbies include thinking up and holding strange festivals (which Estonia, a good friend of Finland’s, often takes part in), spending time in saunas, thinking up jokes (which he uses to lighten the mood with when around Sweden), and eating the infamously repulsive salmiakki (which he finds to be delicious). Often times, he portrays the role of Santa Claus (Santa is traditionally thought to live in the mountains between Finland and Russia). It was noted that out of the five Nordics, he suffered the most hardships in life.